Is Your Nissan Pathfinder a Lemon? One of the many features talked about when buying a new Nissan is the continuously variable transmission (CVT). The benefit of the CVT touted by Nissan is that you’ll experience a smoother ride and improved fuel economy. This, however, has not been the case with many 2013 and 2014 Pathfinder vehicles. Consumers are experiencing the same recurring problems with the CVT in the Pathfinder — everything from noises that should not be coming from a CVT, to engine stalls, to what some are calling the “Nissan Shudder.” It’s happening on vehicles that are only a few months old and we have seen cases where multiple transmission systems are being replaced, but the problems continue to reoccur. Nissan is aware of the problem but has not yet come up with a definitive solution. Currently they’re having customers bring their vehicle into their local dealership to have it diagnosed. The solution that some dealerships are coming up with is to have the entire transmission system replaced, sometimes more than once. Imagine having to change your transmission system every 3,000 miles like you do with oil changes. Nissan CEO Carlos Ghosn singled out the problem supplier as Jatco, a company that Nissan owns a 75 percent stake in. Jatco claims that part of the issue is customers who are inexperienced with their CVT transmissions, and blames the consumer for not understanding what to expect from a CVT transmission system. One would think that even if you knew absolutely nothing about a CVT transmission, you would know that your brand new Pathfinder should not be shuddering at low speeds, or stalling. Does Your 2013 to 2017 Nissan Pathfinder Meet the Lemon Law Criteria? If your vehicle has been taken to the dealership four or more times and repaired under the original manufacturer’s warranty for the same defect, and that defect substantially impairs your use, value, or safety, you may be entitled to relief under the lemon law. Still not sure whether or not your Nissan can be considered a lemon, under the California Lemon Law? Give us a call or contact us via e-mail. Trivia: Who Came Up with the First CVT? 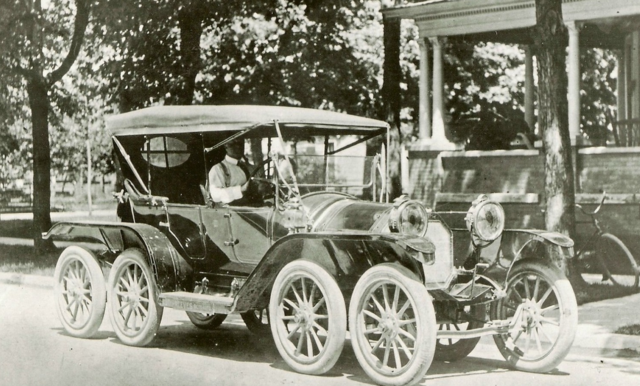 The 1911 Reeves Octo-Auto: It had a 40-horsepower engine, was over 20 feet long, sat 4, and retailed for $3200.00. Milton Reeves (an early pioneer of the American automobile industry) invented a variable speed transmission for saw milling in 1879, which he applied to his first car in 1896 called a “motocycle” [note the spelling]. Reeves believed that his belt and pulley based variable speed transmission was superior to Henry Ford’s Quadricycle with only one speed. However, it was Leonardo da Vinci who conceptualized a stepless CVT in 1490. After trying to deal with dealership myself and accomplishing nothing. I called and spoke to Debbie and her team. She took on my case and fought for me against the dealership. Debbie and her team got me a more than fair deal and I am extremely pleased. My only regret is that I didn't contact her sooner. The staff was very professional and polite. I hope I am never in the need of her services again but if I am she will be the first one I call.